Family, Composite. Color, purple. 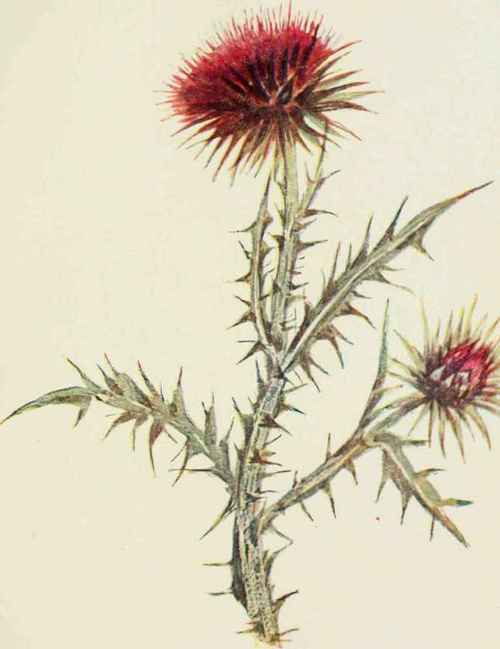 Much like Cirsium, but with leaves running down the stem, and with the winged stem spiny. Large heads, solitary, of the richly colored flowers which when old droop. Leaves, 3 to 6 inches long, lanceolate in shape, deeply pinnately cut, sharply pointed at apex, the lobes very spiny. June to October. In pastures, waste places, and on ballast near seaports, Pennsylvania and New Jersey, northward.